This is guest post written originally to Auth0. Recently I’ve blogged about using tokens to authenticate users in single page applications, I’ve used ASP.NET Web API, Owin middleware and ASP.NET Identity to store local accounts in database, I didn’t tap into social identity logins such as (Google, Microsoft Accounts, Facebook, etc..) because each provider will not supply the same information (profile schema) about the logged in user, there might be properties missing or with different names, so handling this manually and storing those different schemes will not be a straight forward process. I was introduced to Auth0 by Matias Woloski, basically Auth0 is a feature rich identity management system which supports local database accounts, integration with more than 30 social identity providers, and enterprise identity providers such as (AD, Office 365, Google Apps, etc…). You can check the full list here. 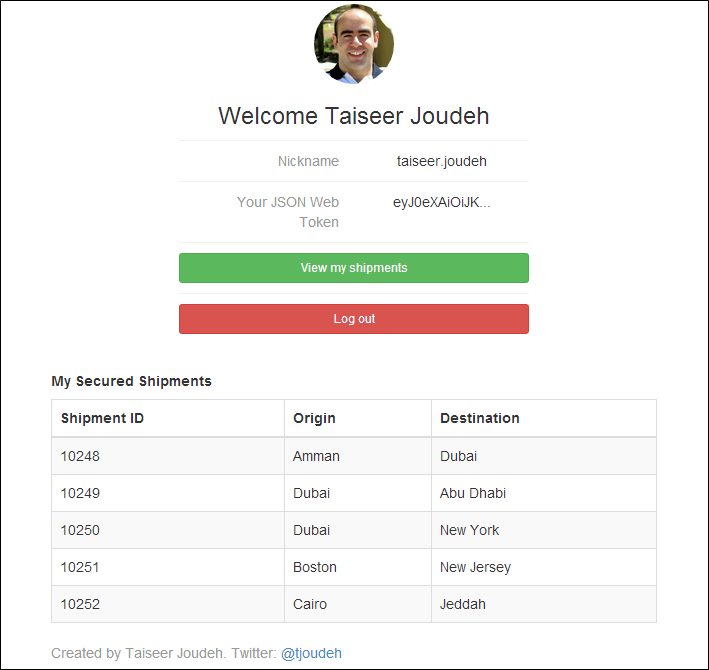 In this post I’ll implement the same set of features I’ve implemented previously using Auth0 management system as well I’ll integrate authentication with multiple social identity providers using less code in the back-end API and in the front-end application which will be built using AngularJS. So let’s jump to the implementation. I’ll split this post into two sections, the first section will be for creating the back-end API and configuring Auth0 application, and the second section will cover creating the SPA and Auth0 widget. 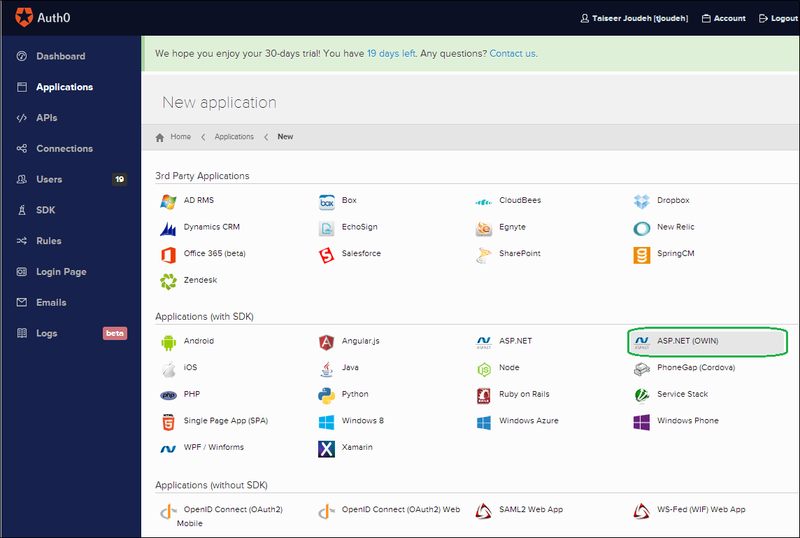 The demo application we’ll build in this post can be accessed from (http://auth0web.azurewebsites.net). The source code is available on my GitHub Repo. After you give the application a friendly name, in my case I named it “ASP.NET (OWIN)” a popup window will show up asking which connections you want to enable for this application. “Connection” in Auth0 means identity providers you want to allow in the application, in my case I’ll allow Database local accounts, Facebook, Google, GitHub, and Microsoft Accounts as the image below. Usually the social accounts will be disabled for all applications, to enable them navigate to “Connections” tab, choose “Social” then enable the social providers you like to enable for your application. Once the application is created, you can navigate to application “settings” link where you will find all the needed information (Domain, Client Id, Client Secret, Callback URLs, etc…) to configure the Web API we’ll build in the next step. In this tutorial I’m using Visual Studio 2013 and .Net framework 4.5, you can follow along using Visual Studio 2012 but you need to install Web Tools 2013.1 for VS 2012 by visiting this link. The first package “Microsoft.AspNet.WebApi” contains everything we need to host our API on IIS, the second package “Microsoft.AspNet.WebApi.Owin” will allow us to host Web API within an Owin server. The third package “Microsoft.Owin.Host.SystemWeb” will be used to enable our Owin server to run our API on IIS using ASP.NET request pipeline as eventually we’ll host this API on Microsoft Azure Websites which uses IIS. The forth package “Microsoft.Owin.Security.Jwt” will enable Owin server Middleware to protect and validate JSON Web Tokens (JWT). The last package “Microsoft.Owin.Cors” will be responsible to allow CORS for our Web API so it will accept requests coming from any origin. Note: The package “System.IdentityModel.Tokens.Jwt” gets installed by default is old (version 1.0.0) so we need to update it to latest (version 3.0.2). We need to read the Auth0 settings for the application we created earlier to configure our API, so open Web.Config file and add the below keys, do not forget to replace the values of those keys with the correct one you obtain once you create application on Auth0. The implementation of method “ConfigureAuthZero” will be covered in the next step, this method will be responsible to configure our Web API to generate JWT using Auth0 application we created earlier. Read Autho application settings stored in the web.config file. We’ve added the JSON Web Token Bearer middleware to our Owin server, this class accepts set of options, as you can see we’ve set the authentication mode to “Active” which configures the middleware to check every incoming request and attempt to authenticate the call, and if it is successful, it will create a principal that represents the current user and assign that principal to the hosting environment. We’ve set the issuer of our JSON Web Token (Domain Name) along with the base64 encoded symmetric key (Client Secret) which will be used to sign the generated JSON Web Token. Now if we want to secure any end point in our Web API, all we need to do is to attribute any Web API controller with “[Authorize]” attribute, so requests containing a valid bearer token can only access it. Note: The JWT Token expiration time can be set from Autho Application settings as the image below, the default value is 36000 seconds (10 hours). Auth0 dashboard allows you to manage users registered in the applications you created under Auth0, so to test the API we’ve created we need to create a user before, I’ll jump back to Auth0 dashboard and navigate to the “Users” tab then click “New”, a popup window will appear as the image below, this window will allow us to create local database user, so fill up the form to create new user, I’ll use email “taiseer.joudeh@hotmail.com” and password “87654321”. Notice that the content-type and payload type is “x-www-form-urlencoded” so the payload body will contain encoded URL, as well notice that we’ve specified the “Connection” for this token and the “grant_type” If all is correct we’ll received JWT token (id_token) on the response. Note: The “grant_type” indicates the type of grant being presented in exchange for an access token, in our case it is password. 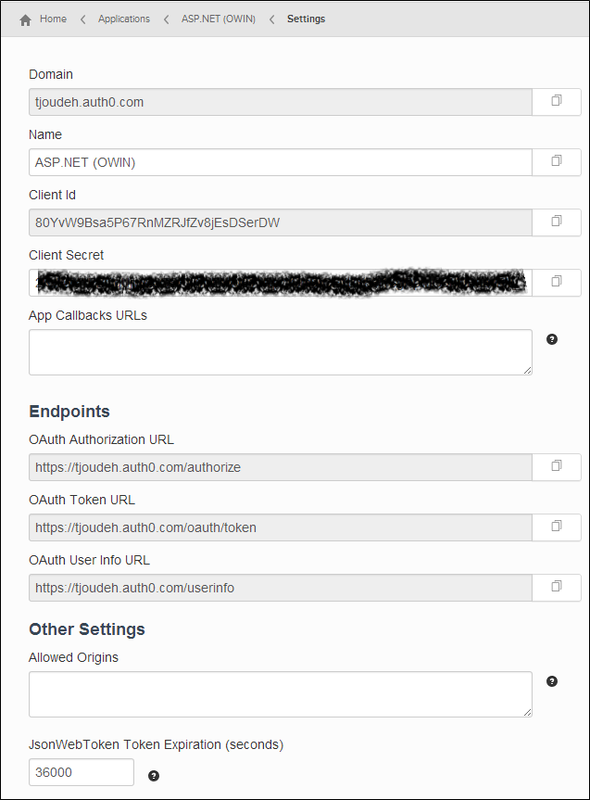 Now we want to use this token to request the secure data using the end point http://auth0api.azurewebsites.net/api/shipments so we’ll issue GET request to this end point and will pass the bearer JWT token in the Authorization header, so for any secure end point we have to pass this bearer token along with each request to authenticate the user. If all is correct we’ll receive HTTP status 200 Ok along with the secured data in the response body, if you try to change any character with signed token you directly receive HTTP status code 401 unauthorized. By now our back-end API is ready to be consumed by the front-end app we’ll build in the next section. 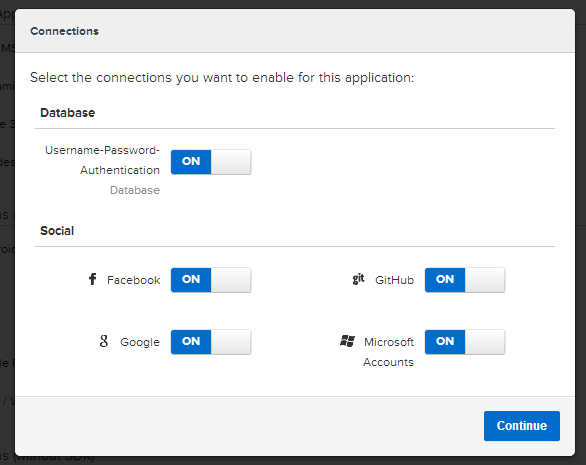 The enabled social login providers can be controlled from Autho dashboard using the “Connection” tab, so for example if you want to enable LinkedIn, you just need to activate it on your Auth0 application and it will show directly on the Widget. 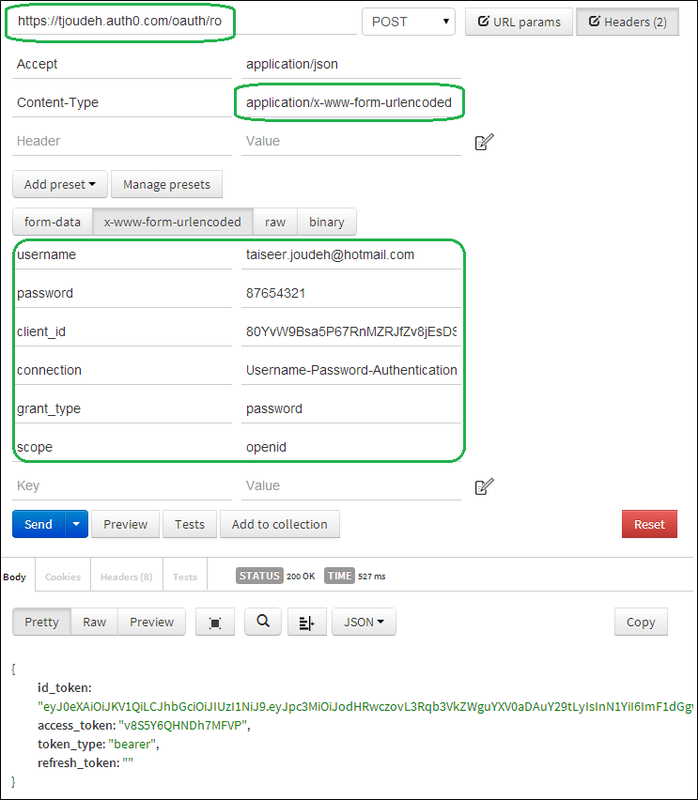 Now we need to add a reference for file Auth0-angular.js, this file is AngularJS module which allows us to trigger the authentication process and parse the JSON Web Token with the “ClientID” we obtained once we created Auth0 application. The callbackURL is used once user is successfully authenticated, Auth0 will redirect user to the callbackURL with a hash containing an access_token and the JSON Web Token (id_token). You can notice that we are injecting the “auth” service and “AUTH_EVENTS”, inside the “login” function we are just calling “auth.signin” and passing “popup:false” as an option, the nice thing here that Auth0-angularjs module broadcasts events related to successful/unsuccessful logins so all child scopes which are interested to listen to this event can handle the login response. So in our case when the login is successful (User is authenticated) we’ll set flag named “loggedIn” to true and redirect the user to a secure partial view named “shipments” which we’ll add in the following steps. Once the user is authenticated the JSON Web Token and the access token is stored automatically using AngularJS cookie store so you won’t worry about refreshing the single page application and losing the authenticated user context, all this is done by the Widget and Auth0-angularjs module. Note: To check how to customize the Widget plugin check the link here. As well we’ve added support for signing out the users, all we need to do is call “auth.signout” and redirect the user to the application root, the widget will take care of clearing the cookie store from the stored token. The implementation for this controller is pretty straight forward. We are just sending HTTP GET request to the secured endpoint http://auth0api.azurewebsites.net/api/shipments, so if the call has succeeded we will set the returned shipments in $scope object named “shipments” and if it failed because the user is unauthorized (HTTP status code 401) then we’ll redirect the user to the application root. Now to be able to access the secured end point we have to send the JSON Web Token in the authorization header for this request. As you notice we are not setting the token value inside this controller. The right way to do this is to use “AngularJS Interceptors”. Thanks for the Auth0-angularjs module which makes implementing this very simple. This interceptor will allow us to capture every XHR request and manipulate it before sending it to the back-end API so we’ll be able to set the bearer token if the token exists in the cookie store (user is authenticated). All you need to do to add the interceptor is to push it to $httpProvider service interceptors array. 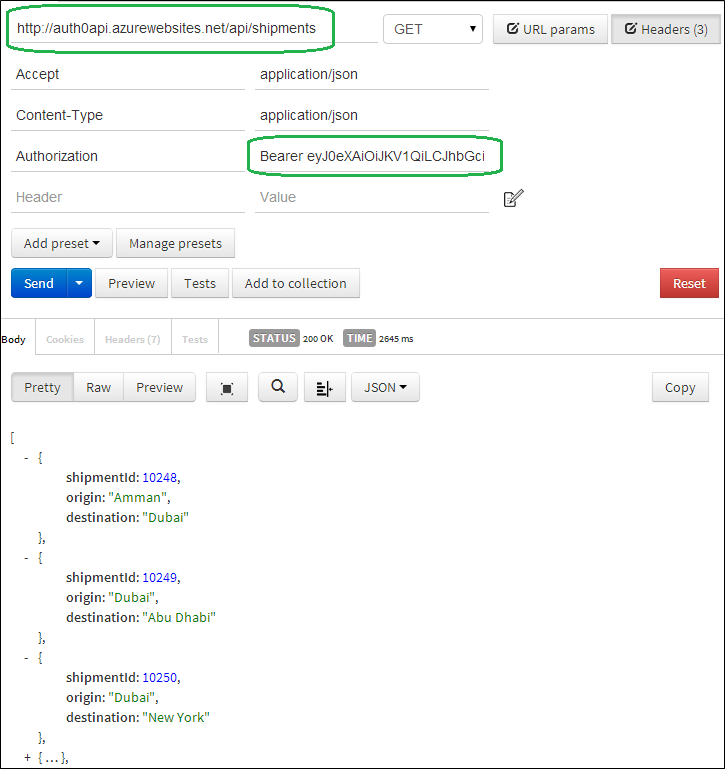 Setting the token with each request will be done by Auth0-angularjs module. By completing this step we are ready to run the application and see how Auth0 simplified and enriched the experience of users authentication. I hope this step by step post will help you to integrate Auth0 with your applications, if you have any question please drop me a comment. Niiiiiiiiiiiiiiiiiiiiiice…. Concise, simple and straightforward… I like that… Thanks for sharing and keep on your good work. It’s always appreciated. 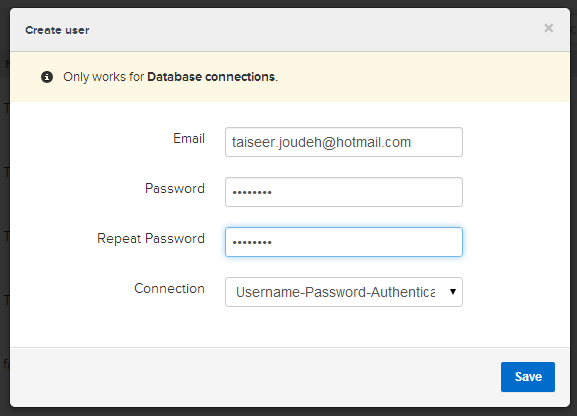 This can be done when you configure your Auth0 account, try to use signup at http://auth0.com and you can see how easy to support local database accounts and store them in MySql. Why are you using the idtoken to access your API instead of the accesstoken? This is the implementation done by Auth0, the access token is returned in field “id_token” when you authenticate against database connections, Active Directory, Windows Azure AD. Hi Taiseer. Thanks for all your posts, and congratulations on your MVP award! I would like to use JWTs in my application. I can’t quite get my head around the Auth0 aspect. I don’t need social logins, and the data I’ll be generating is heavily user-related (timesheet info), so I’ll (presumably) need to store the user data in the same database – e.g. for manager reports to show who (user name, etc) worked how many hours in a month. I also want an ‘administrator’ in the app to be able to create users / assign permissions / etc. So the app needs to control this side of the authorization. Does Auth0 still sound like an option? Or is it not suitable in this scenario? In which case I take it I need to role my own JWT providers (I’m still struggling with the non-JWT examples). Apart from the login widget, what would I be gaining from Auth0? Hi Sean, thanks for your warm words, glad that my posts are useful. Well this has a while since I used Auth0, but mainly if you are interested only in local database account then using Auth0 and the nice abstraction and unifying for social login providers won’t benefit you that much. Your requirements are implementation details that should be handled by your custom logic, Auth0 won’t help here. But before deciding on this, I recommend you to contact Martin Gonto from Auth0, he is Auth0 developer advocate and can give you more insight. You need to add this to FB scopes in Startup class, Search for the right Facebook scopes to include email and phone. Thank you Taiseer Joudeh for one more wonderful article. You are the first person whom I look up to when I have any questions or want to learn any technology. I have recently created a web application and I should admit that it was possible only because of the articles you published in this blog. You are a great inspiration and please continue your good work. Thank you so much for your nice words, I’m happy to hear this. Regarding your questions about Auth0, I remember that I read about adding custom properties as well using your mobile phone to login, but I’m not up to what they recently have on their services, so my recommendation is to reach their .NET customer success engineer Jerrie who should be able to help.